Discussion in 'Hardware Mods' started by michal1315, Jun 12, 2018. 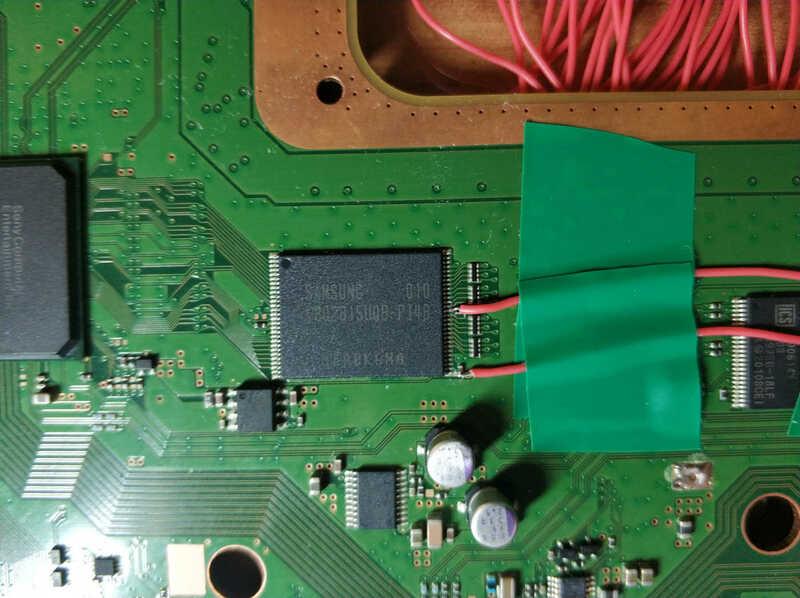 Have anyone tried unbrick ps3 slim cech-2100 when tristate/sbe to ground trick not working. I powering nor area in 3.3V from pc power supply and all time I have instant error „PS3 operating nor”. This is not conection problem because I use E3 linker. 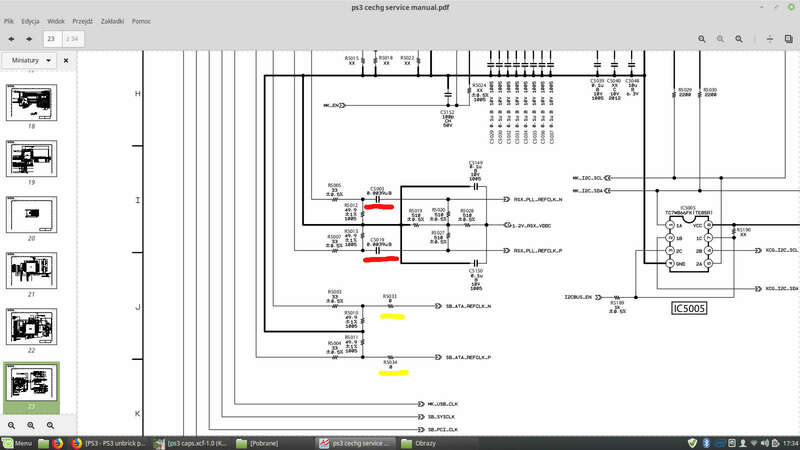 I have idea to cut off power from south bridge because this probably make problem or power supply only nor chip by cuting path like on photo. What do you thing about it? Has anyone make something like that? I make this, i'm only power supply nor chip in 3.3V and in my case they don't make any difference probably fried nor and its area with south bridge at the head. Its totally my mistake with e3 clip and a clamp, i'm f#[email protected]%$# moron. Next console rest too early on semiconductor rainbow bridge. If the console doesn't stay powered on when the tristate is to ground means there is another hardware issue. It may be cell, RSX, southbridge... etc, or the power supply. Did you tryed with another power supply? Thanks for your answer. 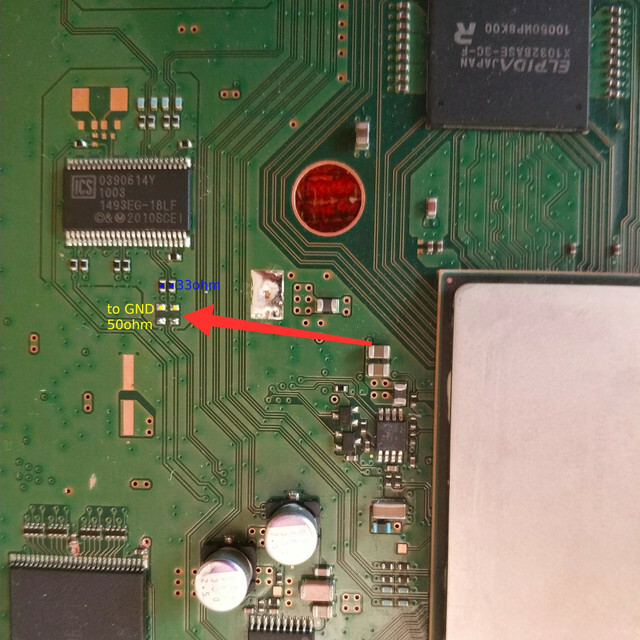 Its may be another hardware problem because i crunch two ceramic caps close to 1493EG-18LF this two caps is probably in RSX_PLL_REFCLK line i'm mark its as red on schema pics or its SB_ATA_REFCLK line because service manual what i have is for sem-001 this mb has ic 1493G-18LFT with different number of pinouts. Caps are replace with 0.0039uF as on schema and now i have different behavior solid green light tristate is not to gnd, cell makes warm but rsx is cold as a corps. Of course bad fw in nor is not fixed. Can you help me with identify correct value of this caps or recommend some one on forum to help me. Or may by you know where i can find ps3 slim sur-001 service manual?